Death Metal Pizza! That is exactly what this place was named. For a kid who grew up on thrash metal, this place was almost too good to be true! It was dark, dreary, and playing ridiculously loud death metal. So loud it almost made it impossible to stay and eat. You wanted to just take your food and leave....That is if you didn't love death metal, like me. Hoeks Death Metal Pizza is located on 320 East 6th Street in Downtown Austin. 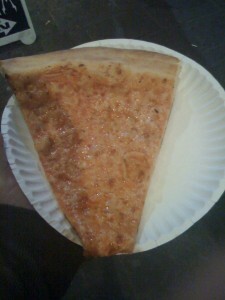 For the masses, this pizza was just a place to grab a slice from the outside counter and keep walking. The darkness inside hid most of the tattoos that were placed around the employees bodies. If they had the proper lighting, I do not think many would actually order the pizza, after seeing what or who was making them. But all this did not matter to me. I got to go in and eat pizza and listen to Slayer. This is a perfect combination for me. The pizza maker oddly took pride in making his pizza, and as I watched him make a few pies, I was kind of in shock with the care and effort, he managed to put into each pie. Even amount of sauce and cheese, make sure the dough was smoothed out etc. Austin, has to be one of the WORST tasting pizza cities I have ever traveled to. After having pizza from Roppolos, Jacks, The Onion and some others that sucked so bad they do not deserve mentioning right now, I naturally assumed that Death Metal Pizza would also be atrocious. Although this pizza is sub-par compared to most places around the country, in Austin this place stands out as one of the best. If you are downtown and in need of a pizza fix, I would recommend going to Hoeks Death Metal Pizza instead of any other place downtown. On my second night eating there, I was a bit displeased with the bubbles in the pizza, but that could be due to the fact that even the pizza maker cannot see the pies as they are being made, due to the darkness. So in a city known for pizza that should be Called Death Pizza, Death Metal Pizza Jams out and manages to be the best! Death Metal Pizza gets 4 out of 8 slices.